When your friends are like family, and you’re looking for a comfortable place outside of the home, it’s time to take a trip to Haberdish, 3106 N. Davidson St.
Haberdish was one of those places I held off on for a while. We all have a list of restaurants that we hope to check off throughout our travels (or am I the only one? ), and I was a little worried that Charlotte visitors were tooting the horn of a place offering a local experience of the Southern fare that’s so often done well at smaller, less eccentric restaurants on the outskirts of the city. But after gathering a few of my favorite people — ones willing to pass the plates, share the spoons and pause to photograph the food before eating it — Haberdish aimed to please, and that it did. A play on the word haberdashery, the restaurant hopes to “use the table to bring our mill town’s history to life through food.” Its social media posts are what first caught my eye, with macaroni and cheese covered in crispy chicken skins, hush puppies with sweet tea butter, and even a CBD-infused drink called “The Apothecary Cocktail”. Haberdish is located at 3106 N. Davidson St. in Charlotte. Jen Tota McGivney of Charlotte Magazine gave credit to Colleen Hughes, Haberdish’s bar manager, for creating a handcrafted drink menu with “the eye of an artist, the mind of a scientist, and the playfulness of a kid.” Each cocktail is appealing to both the eye and your taste buds and would be almost impossible to replicate elsewhere. My boyfriend Peyton and his brother, Parker, think on a similar wavelength and both ordered the Chocolate Peanut Butter Old Fashioned, which came with ice cubes that captured yellow roses in time, which glinted as they melted in each cup. We had been unaware of the famous, frozen, flower-encompassing ice cubes prior, but were just as fascinated by them as a fellow table, which received a bowl of the Cranberry Sage Punch, and welcomed their floating appearance with a few snaps. The ingredients, however, were also far from what we could concoct at home: peanut butter infused larceny, tempus fugit crème de cacao, coffee and angostura bitters, and a candied orange garnish. There was one other cocktail, Stolen Dance, that came adorned with a singular sage leaf that looked debonair, but not pretentious. It was perfect for Amy, Parker’s girlfriend, and featured Doc Porter’s Gin, a house-made cherry sage syrup and cap course rouge aperitif. Moving into a more comfortable realm of language and palate, the restaurant’s main menu had a heavy focus on snacks and sides. I wasn’t opposed to this idea, and instead welcomed it for its variety and encouragement of sharing, rather than stockpiling on our own plates. The only problem? Choosing what sounded the most delicious, and ensuring we had enough to sustain ourselves. I operate with the mentality that it’s a sin to even turn down snacks, so we went with the daily pickle, which was a Spicy Garlic Dill, and the Pimento Cheese Ball. Two pimento cheese connoisseurs were present at the table, and it would have to live up to the test, rolled in toasted spiced pecans, served with fresh slices of tart green apple and fried saltine crackers. We had a feeling the pickles would be hard not to love. The pimento cheese was mild and had a creaminess that paired well with the savory saltines. The texture wasn’t off-putting, especially combined with the fine crunch of the pecans, and surprisingly held its shape despite various scoops around the table. It also came plated with pickled red onions, which really took the flavor up a notch, adding a bite of vinegary tartness. If onions aren’t your thing, the sliced green apples could be a substitute to cut the overall heaviness of the snack. The spicy garlic dill pickles were crisp and offered an addicting, light-garlic flavor with a slight peppery spice, and were enough for a table to share without debate. We made use of the sharing spoons after the snacks were finished, getting one order of the two-piece fried chicken for Parker, a half chicken with a waffle for Peyton and I to share, an order of the savory bread pudding, a small plate of the sweet potato dumplings, a bowl of kale grits, a heavy scoop of pickled coleslaw and a vegetarian-friendly option for Amy, the cauliflower steak. Our table felt like Thanksgiving when the food arrived, carefully arranging the plates so everyone could claim their portions and pick their favorites. When we got our first tastes of it all, the comforting, mouth-watering feeling of the now passed holiday was only elevated. Amy and I preferred the savory bread pudding, which came baked to a crisp, not at all gooey, and had a hint of cornbread sweetness combined with the gruyere and herbs. It won us over, undeterred by our usual distaste for sweeter cornbread.The boys avoided it, instead opting for the kale grits, which Peyton compared to a broccoli-like flavor that both of them enjoyed. The grits and cornmeal in each came from Anson Mills, aligning with Haberdish’s local focus by using their organic and heirloom grains from Columbia, South Carolina. The cauliflower steak was two thick-cut pieces of cauliflower that were “chicken-fried with smoked chimichurri drizzle.” It was smoky in a way that felt too good to truly be vegetarian, but tasty nonetheless. The cauliflower’s crunch was the same as the fried chicken and was more than enough for two to share, especially with sides. The fried chicken claims to be the second-best to your grandmother’s, and it was great, but maybe not quite up to home-cooked, family standards. The half chicken was fit with a leg, thigh, breast and wing, all of which were well-cooked, juicy and paired best with the house-made habanero hot sauce. 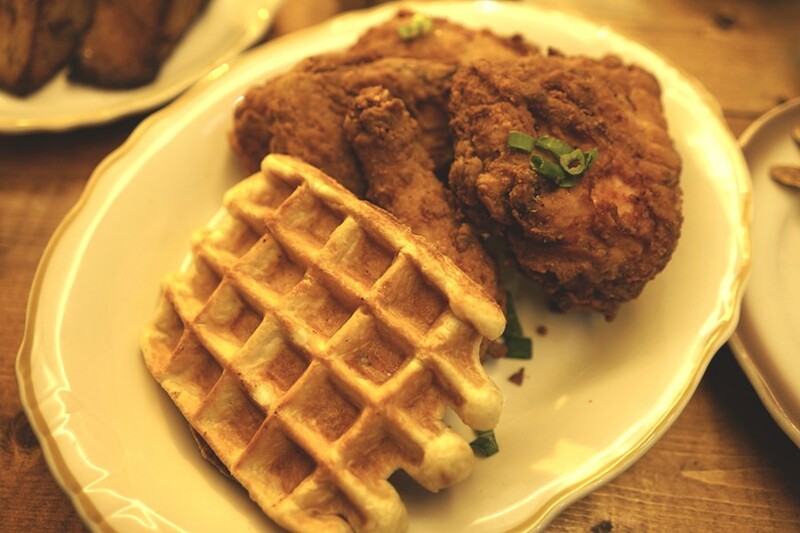 We found the waffle to be unnecessary once we dug into the chicken, but it went well with the honey and bourbon-like syrups offered on the side and would satisfy your chicken and waffle craving for brunch or dinner. The final two dishes were excellent, and some I’ll be craving for some time. The pickled coleslaw, which came adorned with a few slices of bread and butter pickles, was some of the best slaws I’ve had in the South. The vinegar-based flavor from the pickled cabbage and red onions, mixed with the light (not heavy or mayonnaise-based) creaminess, made it a great addition to any plate. I gladly ate it by itself, but it was also a nice combination with the saltiness and crisp skin of the fried chicken. I could have easily finished the sweet potato dumplings on my own. 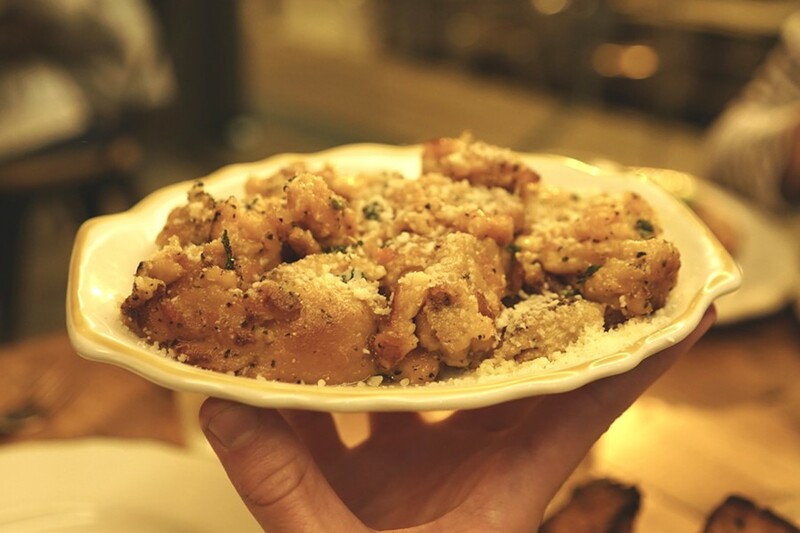 It was as if Thanksgiving was beaten into the dough of each one, “hand spooned” with brown butter, spiced with sage and sprinkled with parmesan. They weren’t overly sweet but had the buttery, herb-based flavor that is found in holiday comfort food, and quickly became my new must-have dish. Maybe not what you need for a night of snacks with friends, but definitely what you want when you’ve come to stay awhile. Welcoming, warm and wait-worthy, Haberdish is a must-try. The food and cocktails live up to the hype, despite what many might view as a hipster vibe and infamous Instagram check-in. The atmosphere will make you kick back and relax — even on the heated patio in the middle of winter. Share a few cocktails, browse the extensive wine menu, or just opt for some house-made tater tots, and memories will be made in no time.